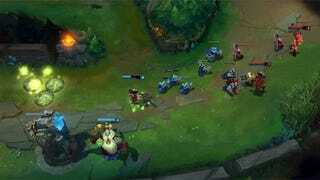 League of Legends' newly-minted "Bard" champion just dropped into the game by surprise yesterday. Players are extremely curious about this "wandering caretaker" and his potential in the game thanks to the big bearded guy's more...distinctive qualities. What makes him stand out, you ask? A few key things. I'll break it down in further detail below. Bard is designed to be a support character. Support is a position played on the bottom lane of Summoner's Rift, the main League map, alongside a counterpart position known as "Attack Damage Carry," or ADC for short. The point of the support, in a general sense, is to, ya know, support the ADC on your team—making sure they don't die and helping them secure enemy kills by, say, stunning opponents or healing your teammate. Bard sticks to the support template, but in a unique way. 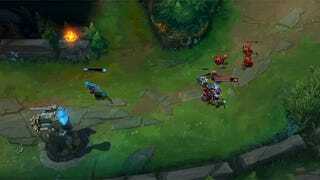 League developer Riot has described him as a "wandering," or "roaming" support, meaning that he's encouraged to step outside of his specific lane and move around the entire map. 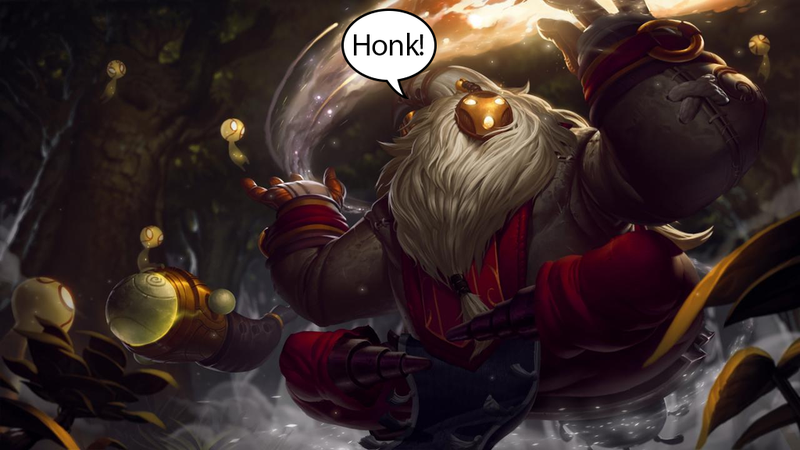 The game incentivizes Bard's roaming with his passive ability, which deposits little wind chimes around the map at regular intervals for him to pick up. These grant Bard speed boosts and experience points—effectively offering him a trade-off so he doesn't lose out on anything by leaving his lane. Healing and teleportation powers have existed in League of Legends for a while now. But Bard has a particularly idiosyncratic approach to both. Suffice to say, he looks like he'll be able to do some interesting things to shake up the structure of the teams he plays on by reconfiguring each champion's strategic location and purpose on the map. This is mostly just a personal theory for the moment since Bard is so new to League still, but given all his special qualities I just mentioned, I could see the champion playing an interesting role in the jungle going forward. Players haven't been totally satisfied with the jungle for a while now given several ways that Riot has changed it to make playing as a jungler prohibitively difficult. While the developer also introduced a few tweaks for jungler champions specifically this week, Bard's flexibility as a "roaming support" seems like it'll encourage players to help out in the jungle in addition to the bottom lane. I mean, think about it: he's already supposed to be moving around the jungle to pick up those little wind chimes and things. He can also drop health packs that are available to be picked up by a teammate at their earliest convenience. A big problemwith the jungle, meanwhile, is that many players feel the bad guys within have gotten so tough that only a few champions with incredibly high base health and mana stats ("sustain" in League terms) can survive in their for long. You do the math. For the uninitiated: the dragon is one of the jungle monsters in League that grants special upgrades to your entire team whenever you manage to kill one. Trying to take down the dragon often makes for pitched battles between most (if not all) champions from both teams as a result, since both are vying for the same buffs to get an extra leg up for the rest of the battle. Using his portal to sneak in and nab the dragon kill from the opposition means that Bard truly does have some massive troll potential. In addition to his healing and teleportion powers, Bard also has a unique ultimate ability, or ult. Ults are the most powerful moves each champion has—the one that takes the longest to unlock in a game, and is activated by pressing "R." In Bard's case, his ult casts a spell that immobilizes everything within a small circle—putting the targets into a temporary stasis during which they a) cannot move and b) cannot be damaged or affected by other spells in any way. And I really mean everything is immobilized. Even turrets will freeze up for the duration of Bard's spell if they're in the target area. Even if it doesn't buff targets or deal any damage, Bard's ult is useful in a number of different circumstances. Freezing turrets means that all those annoying situations where an enemy champ flees behind the safety of one of their team's defenses could be effectively neutralized—granting you and your teammates a few extra seconds to keep pummeling them. That also means you can use it to freeze enemy champs who are trying to run away. It might not hurt them, but it'll give Bard and co. time to catch up and resume their beating once the opponent leaves stasis. So, yeah. I'm guessing that Bard's ult might end up getting nerfed once or twice before the champion really gets into the swing of things. But this is a very powerful ability, to say the least. At least, when it's used properly. Clumsy noob that I am, I kept missing my specific target and accidentally freezing teammates (and even myself) with Bard's ult. I'm guessing more skilled support players won't have this problem. But still: Bard will undoubtedly make for some silly and embarrassing accidents. Like every good League champion, Bard will continue to get more interesting as players push him to his limits and find out what he's truly capable of. Now if you'll excuse me, I've got a date with some pikmin—er, I mean, meeps.